Microsoft has unveiled the Nokia 230 Dual SIM feature phone in India. Priced at Rs. 3,869, the Internet-enabled feature phone is now available to buy via the company’s official store. Unfortunately, there is still no word on the availability of the single-SIM Nokia 230 phone. Last month, Microsoft had promised that the Nokia 230 (and Nokia 230 Dual SIM) will be launching in India this month. Considering that the Microsoft’s official site lists the Nokia 230, we can expect the company to launch the model soon. At the global launch, Microsoft had touted the Nokia 230 and Nokia 230 Dual SIM as ‘premium quality Internet-enabled feature phones.’ One of the biggest highlight of the Nokia 230 Dual SIM is that it sports a 2-megapixel front and rear cameras. Both cameras pack LED flash modules. Another notable feature of the Nokia 230 Dual SIM phones are they feature sandblasted aluminium cover. Both the phones come with the Opera Store access where users can download one free Gameloft game every month for a year. This is however unclear whether the offer is applicable for Indian users as well. Last month, the company had confirmed that the store was available in select markets. Both the new phones come with the same set of specifications except that the Nokia 230 Dual SIM supports dual-SIM functionality. Both the handset support Micro-SIM cards, and both run Nokia Series 30+ OS. Other preloaded apps include Bing Search and Opera Mini browser as well as MSN Weather. The Nokia 230 Dual SIM features a 2.8-inch QVGA (240×320 pixels) LCD display. It supports expandable storage up to 32GB via microSD card. Connectivity options on the phone include GPRS/ EDGE, Bluetooth v3.0, Micro-USB, and a 3.5mm audio jack. Microsoft has packed a 1200mAh battery in the handset that is claimed to deliver up to 23 hours of talk time and up to 22 days of standby time (dual-SIM model). The Nokia 230 Dual SIM measures 124.6×53.4×10.9mm, and weighs 92 grams. 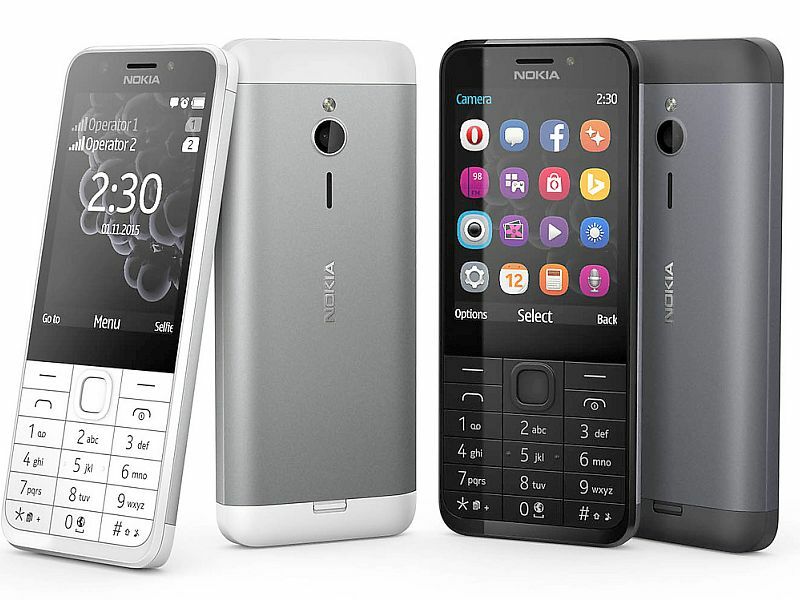 The Nokia 230 Dual SIM will both be available in glossy Black and White colours.